Iran, Libya, Somalia, Syria and Yemen, North Korea, Venezuela, Iraq, Sudan—what these countries have in common is that they were, or are, on President Trump’s travel ban. By way of musical reaction to the travel bans, The Kronos Quartet turned inward and outward and commissioned composers from those banned countries. Egyptian composer and keyboardist, Islam Chipsy, is a classically trained “street artist,” and is one of a three-member group, EEK. Billed primarily as linked to the electro chaabi and Mahraganat scenes in Cairo, Chipsy’s music marries EDM (Egyptian Dance Music) with an eclecticism that is as unique as it is fearless. Drawing on more than forty years of collaboration with prominent and emerging composers from around the world, Kronos is commissioning a library of fifty works designed to guide young amateur and early-career professional string quartets in developing and honing the skills required for the performance of 21st-century repertoire. Kronos’ Fifty for the Future … commissioned [an] eclectic group of composers – 25 women and 25 men – representing the truly globe-spanning genres of string quartet literature in the early 21st century. The project compositions are intended to be approachable by musicians of a wide range of accomplishment, from youth ensembles to beginning professionals. Kronos/KPAA has commissioned more than 850 works since it was formed in 1973, but Fifty for the Future represents the largest single artistic and educational project that it has undertaken. All of the composers’ music that is part of Fifty for the Future showcases fearless energy, determination, passion, and a will to be. Witness this music for change for yourself, as the Kronos Quartet heads to Europe and returns to the United States to perform music from banned countries. Thank you, Aretha Franklin (1942-2018)! Thank you for Respect, and so much more! Thank you for your voice. A song is much more than a song. And Franklin tapped into tone, texture, lyrics, and more for all sorts of messages and meanings. As Simon Frith notes, it’s not just what singers sing, “but the way they sing it.” And Franklin’s voice–her Respect–isn’t just a voice, but a voice that embodies self-respect, and therefore demands and commands self-other respect. Thank you for your spirit. Franklin’s regal-ness shown through each and every appearance, performance, and recording. Yet, her overwhelming joy in life, as expressed through her appearances, performances, and recordings, helped listeners experience the thrill of the moment and beyond; helped listeners understand and appreciate a sense of freedom; helped listeners engage with the values of feminism; helped listeners tap into their sexuality; and helped listeners feel love. Thank you for your activism. Whether it was to lend support or a song to a cause, you were there. Franklin’s 76 years on Earth bookended a grand arc of tumult, letdowns, progress, setbacks, terror, and hope in American history. That in itself might not be a remarkable feat so much as a reminder that all black people older than 53 have seen and lived through hell. But Aretha—and that first name is sufficient, as it was in black churches and parlors for half a century—was an architect of a movement as much as a witness to it. She toured with the actors Harry Belafonte and Sidney Poitier to raise money for King’s Southern Christian Leadership Conference in 1967, when the organization was in dire financial straits and was attempting to embark on a Poor People’s Campaign. She was an activist who strained to keep a movement going even after King’s assassination, and who worked to support the Black Panthers and attempted to post bail to free the activist Angela Davis from jail. She loved black people. In this country, that simple fact was radical enough. But most importantly, thank you for being YOU! Ms. Franklin’s respect lasts for two minutes and 28 seconds. That’s all — basically a round of boxing. Nothing that’s over so soon should give you that much strength. But that was Aretha Franklin: a quick trip to the emotional gym. Music educators, as you start to plan out your school year: How will you celebrate Franklin’s voice, her passion, and her ability to stand up for each and all? What is needed is a realization that power without love is reckless and abusive, and that love without power is sentimental and anemic. Power at its best is love implementing the demands of justice, and justice at its best is love correcting everything that stands against love. And this is what we must see as we move on. 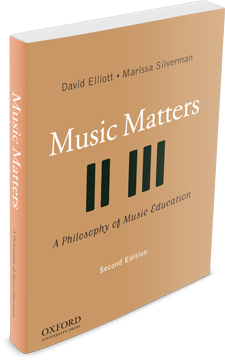 As we state in Music Matters, music making and listening can contribute to a sense of cooperation, bonding, and interrelatedness. The Playing for Change organization knows this well, and takes this even further. By uniting diverse musical communities through song, the group also values and appreciates the integrity and diversity of the musical fabrics of various musical communities. What might the world look like if we all honored and celebrated each other through song? We have faith in the future; most of all, we have faith in all the peoples of the world. So, in celebration of each and all, we hope “Gimme Shelter” will further inspire faith. Excited to join the Rhode Island Music Education Association at their Conference: Music for Every Child: Diversity and Social Consciousness in Music Education. There, we’ll be speaking on: Advancing Social Justice through Music Education. Common sense notions of “social justice” imply the uncovering of injustices, imbalances, and untruths in order to support and promote a more equitable social order. Beyond conventional wisdom, what is “social justice” and can we conceive of social justice and “artivism” for music teaching and learning in concrete ways? Our presentation will focus primarily on philosophical underpinnings for advancing social justice through music education. But we will provide practical examples and strategies for justice-ing music teaching and learning. PROVIDENCE, RI – On Saturday January 13, 2018, the Rhode Island College Department of Music, Theater, and Dance, the Rhode Island College School of Social Work, and the Rhode Island Music Education Association will co-sponsor a conference titled “Music for Every Child: Diversity and Social Consciousness in Music Education” in the John Nazarian Center for the Performing Arts, 600 Mount Pleasant Ave., Providence, Rhode Island. Designed for music educators at all levels, this conference will combine national, regional, and local experts in the fields of music education, social work, and community-driven arts programs to explore how to meet the musical and social needs of the diversity of students in southeast New England. Topics will include social justice, behavioral supports and resources, and social and emotional learning, among others. For more information, a detailed list of sessions and speakers, and to register for the event, please visit www.rimea.org/pd. The $40 registration fee includes lunch. College students may register for a reduced price of $15.